yesterday was my son's 4th day. we had a small celebration with the family and he was happt to received a gift from my cousin and my brother' gf. happy birthday anak i wish you all the best that life has to offer. Hello guys! How was your weekend? Hopefully you had a wonderful weekend. Anyway let me take this opportunity to greet you all “Kung Hei Fat Choi”. Let me give you a brief history of Kung Hei Fat Choi. Chinese New Year or Spring Festival is one of the most important traditional Chinese holidays. It is often called the Lunar New Year, especially by people in mainland China and Taiwan. The festival traditionally begins on the first day of the first lunar month (Chinese: 正月; pinyin: zhēng yuè) in the Chinese calendar and ends on the 15th; this day is called Lantern Festival. Chinese New Year's Eve is known as Chúxī. It literally means "Year-pass Eve". According to tales and legends, the beginning of Chinese New Year started with the fight against a mythical beast called the Nian or "Year" in Chinese. Nian would come on the first day of New Year to devour livestock, crops, and even villagers, especially children. To protect themselves, the villagers would put food in front of their doors at the beginning of every year. It was believed that after the Nian ate the food they prepared, it wouldn’t attack any more people. People also used firecrackers to frighten away the Nian. From then on, the Nian never came to the village again. The Nian was eventually captured by Hongjunlaozu, an ancient Taoist monk. The Nian became Hongjunlaozu's mount. Isn’t surprising how social networking influence some people. I once addicted to social networking, back them my day is not complete without logging in to the group three to four times a day. I am quite sure some of you is a social networking addict at one time or the other. Social networking like Acobay permits members, to meet new friends, mingle with other people all over the globe and interact with them. You can also share and exchange ideas in some stuff, such as cars they drive, places they visited, movies they love, games they play, phone they use, book they read and many more. So hurry be one of the Acobay consumer network member. I am currently making a layout for a blogger friend. I know the layout I made is not that beautiful compared to other layout you see in some other blog. What matter is I am learning little by little. Since the layout and graphics is downloaded for free I am not changing any penny for it. I'll be posting the layout as soon as I am done with it. The un-employment is rapidly increasing in any place nowadays as there are thousands of employees lost their job because of the world wide crisis. Some companies opt to declare bankruptcy or opt to lesser the amount of employee. With this looking for job at this point of time difficult and competition is at the high point. Anyway, if you are in search of a job why not visit salesjobs.net. Sales Jobs Company is the number one source of sales professionals. That is why the sales job search of this company is used by most companies and job seekers. is the new show aired in primetime bida of ABS-CBN. It feature Gerald Anderson, Kim Chui and Jake Cuenca. I happened to watched the lunching of the show and I really like it. In fact I want to follow the show but then I know it is impossible because I am sleeping when the show is aired. Hay.. hopefully, I can watch it 3 times a week. Admit it ladies, we dream to walk down the aisle and exchange I do’s with the man of our dream. However, there are lots of things that need to go trough before you can grasp your dream wedding. You have to have a boyfriend that is mentally, spiritually and financially ready to bring you to the altar. Wedding preparation is challenging and at the same time draining just imagine the stuff that need to be done before the big day. Anyway if you are from Cyprus planning to get married or dreaming to have a grand wedding in this beautiful place fret no more because a Dream Weddings In Cyprus can be attain without any hassle. All you have you to do is visit this website called eliteweddingscyprus.eu and find out what you need to do. So hurry visit the site now and have a wonderful and memorable wedding in the island of love. 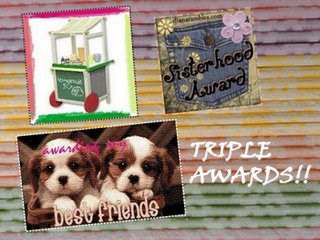 Lynn share bunch of blog award to me. Thanks you very much sis for sharing this great award to me I really appreciate it. Cerebral palsy is an umbrella term encompassing a group of non-progressive, non-contagious conditions that cause physical disability in human development. It is a caused by damage to the motor control centers of the developing brain and can occur during pregnancy, during childbirth or after birth and few develop in the age three. I remember few months ago I was crying while watching MMK. The story is about a mother who has a kid with cerebral palsy. I salute her on how she takes care of her ill daughter because it is not easy. Anyway if you know someone who has this kind of illness because of medical mal-practice there is a site that is design to help cerebral palsy victims. Yeah guys, i know. My last post here was last week and since then I never updated this blogie. I have been making layout for my other blog Thought of a SAHM. At last I am done with it, but still it seems that I am lazy to blog. This week is very slow I haven't done any paid post and it because all my 4 blogs that is listed in TP has a PR of 0. And I not quite sure if the traffic of my blogs are good enough because have been neglecting blog hopping for a decade now. Hopely I can concentrate on gaining my traffic back again. We can’t deny the fact that internet is the best resource of everything. Millions of people over the globe is relaying in to the internet. You can shop through the internet, you can pay through the internet, and you book through the internet and many more. And because you can search hundreds of website that has the same specification you should be cautions on which online store or company to trust. I recently came across this site called Hottest Products that put all the hottest reviews on the web for all online products that you may need. If in case you are searching on Wedding Planning Guides,.hottestproducts.net is the right place to visit. They assure you that their product reviews will give you the type of information you want to know before you take the plunge and buy. Be sure to check out this site before your next purchase online. It’s a rainy morning once again, I really thought the Mr. Sunshine will continue to shine today as it was up the whole day yesterday. Hay… mud are all over the backyard once again. I just hope that the rain will stop soon. It’s almost two weeks after Christmas and I am sure you are planning to call your family and friends that sent present to you. Imagine if you have to make a 'thank you' call to some relative and friends I am sure you will have to pay a higher bill. How much do you often call your family and friends if you could call them without paying extreme phone bill? Have you heard about CallingAmerica.com? For all of you who have not heard about this wonderful network, it is an ad-supported Web service that lets you make phone calls to any number in the United States from any computer with a Web browser and a broadband connection. Great offer, right? I am sure everybody would love to try this FREE service. All you have to do is visit callingamerica.com and register free. After that, you can now start calling across the U.S. for free to any landline or mobile phone in the country. If you choose not to register you cans till use the service but calls are limited to 2 minutes only. But since it’s FREE and the service is supported by advertisements, callers will heard a brief ad before the call is placed, but you don’t need to fret as the ads only takes 15 seconds long at the most. If you are unconvinced with the offer you can check out NY Times Article here.